A shrill high pitched wailing pierces through the darkness, I stir from my sleep and my mind scrambles to find its bearings. The lone monotone male voice strains out the adhan “call to prayer”, projected through distant tinny loudspeakers, that have long lost their ability to enhance the grating sound – and morning is broken. Yet again, I have failed to check the location of the local mosque before booking a hotel!! When will I ever learn? I think to myself before I quickly realise, their is no escaping the noise! If not a local mosque, then the chain reaction it sets off…dogs barking, car horns honking, band practice (At 6 am!! With drums AND saxophones!!) I sigh, roll over and the prayer stops with a final salute to ‘Aaaallllllaaaahhhhh’! 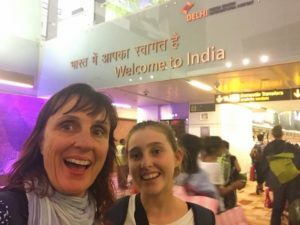 Exhausted from 16 hours of travel from Australia to New Delhi, India, I drift back to sleep musing over the events of the night before… and smile to myself, ‘Welcome to India’! 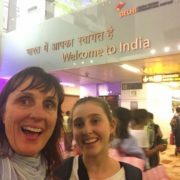 This was my daughter, Cadence’s first trip to India with me, and we were a little excited about the prospect of being greeted at the airport, with my name on a placard, no less, Ooo la la! 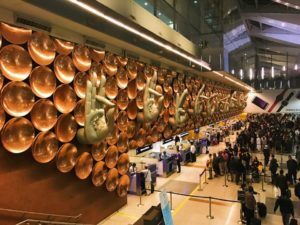 I rummage through my bag as we get to the exit door at the airport to find and recheck the hotel information, as it was evident we could be led astray by rogue Indian drivers, and end up, well, anywhere else BUT our hotel. I am not sure what it is, but taxi drivers in India, all seem to have a scruffy kinda, just slept in my taxi for three days without brushing my hair or changing my clothes and I’m not in a rush, but I need the money type of look. This guy, however, once he had confirmed who we were, by showing us the hand written Airasia flight number on the back of his printed sign (which also gave me a little more confidence that WE had the right guy) took off out of the airport, motioning us to follow him at a pace that reeked of ‘let’s get outta here before the real guy can catch us’… Welcome to India! He sped ahead, joined the queue to pay for parking and signaled us to wait. We moved to the side of the pay booth and I watched him getting slightly agitated, as the guy in the booth fumbled with the computer, pushed and pulled a few cords to stir the cumbersome and rather antiquated looking machine back to life, before processing the parking ticket. I saw the 180 rupee total pop up on the computer screen and as our guy handed over a 100 rupee payment, a heated exchange between our guy and the parking attendant took place. Ahhhh…. that’s why he was in a hurry, the parking time had ticked over into the next price bracket! The attendant stood firm, and our poor guy had no choice but to extract an additional 80 rupees from the wad of notes that he had plucked out of the back pocket of his dusty skinny jeans. He shook his head and motioned us to follow him. He took off again, ducking and weaving through the car park in search of the car. I probably should have then picked up on the notion that this guy liked to move fast, but that’s not what your thinking as you are scrambling to keep up with your guy whilst squeezing between cars in the middle of a car park full of frantic taxi drivers all converging on a single exit. It was 10.30pm and the traffic was chaotic. Not chaotic in the western world sense, that is, many cars in their lanes and moving slowly, this is chaos on a whole other level; many cars, no set lanes and apparently for our guy… no rules! As we exit the airport and join the highway, our guy roars up the inside lane swerves left, then right, narrowly missing the back end of a brand new Audi on one side, and a rusty old truck with well worn tassels swinging from the bumper displaying a colourful “Horn Please” sign, which our guy happily acknowledges, on the other side. This game of ducking, weaving, honking and flashing lights at anyone who got in our way for the entire 40 minute car race to the finish line ( ie, our hotel). I ask our guy his name, ‘Deepak’. Do you speak English? ‘Little, Little’ he says as he gestures the universal symbol for small with two fingers held out close together. He then says ‘AC ma’am?’ The February air is a cool 17’C outside, and I’m not much of a fan of air conditioning, however, as I reply ‘No’ and he rolls down the windows, the famous Delhi pollution assaults my nostrils, I feel the gritty air scratching my eyeballs and immediately regret my decision not to opt for the blood chilling air con over the crisp gritty pollution… Welcome to India!! All is going well, our guy points out India gate, as we whizz past at what feels like 100 kms/ hour, overtaking everyone on the road. I see the massive Delhi police headquarters, and the sign to Delhi railway station, so we are getting close, and yes, going in the right direction, as far as I can remember. Next minute we take a sharp left down a side street, no street lights and two dark shadowy figures walking down what appears to be a dead en street. The car comes to an abrupt stop. My stomach churns, this is not right! The driver mutters something under his breathe, throws the car into reverse and he does a three point turn, back onto the main road. A moment later we turn down the next street on the left and are blinded by lights, cars and motorbikes parked on the roadside, a cacophony of horns pierce the air and a traffic jam of tuk tuks and cars cramming to pass each other on the narrow road. Again the car stops and our guy says one word ‘Marriage’! We look to our left and see not one, but two huge wedding halls, coloured saris draped on metal frames. 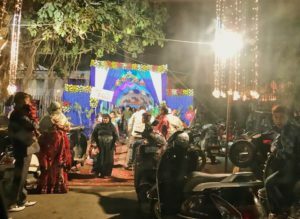 Chandlers hanging precariously from thin metal poles, multicoloured lights dangling from flimsy tree branches and a gaudy sparkling sign hanging at a very stylish designer angle in fluorescent pink and silver, announcing ‘Manu weds Ramshi’. We can see the shadows of the wedding guests through the sheerness of the fabric, and at the entry halls, the departing guests, dressed in their finest clothes are piling into autos and climbing onto motorbikes. After a lot of manoeuvring back and forth, to get through, we drive around the corner, and our guy points out the barrackade that had prevented us from entering the previous laneway, again uttering the words, ‘marriage and traffic’. Ahhh… Our street had been blocked due to the weddings! The street is dark with the exception of a brightly lit building, proudly displaying the sign, ‘Hotel Tara Palace’ . Our guy turns and wobbles his head that signifies, here we are, I smile, nod and think to myself… Welcome to India!